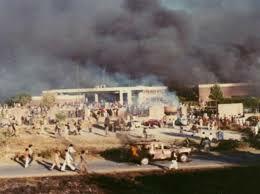 The November 21, 1979 attack on the American Embassy in Islamabad started as a small group demonstration in front of the embassy, where protesters shouted anti-American slogans and demanded entry into the campus. Police officers were able to stop the protesters and have them leave the area. 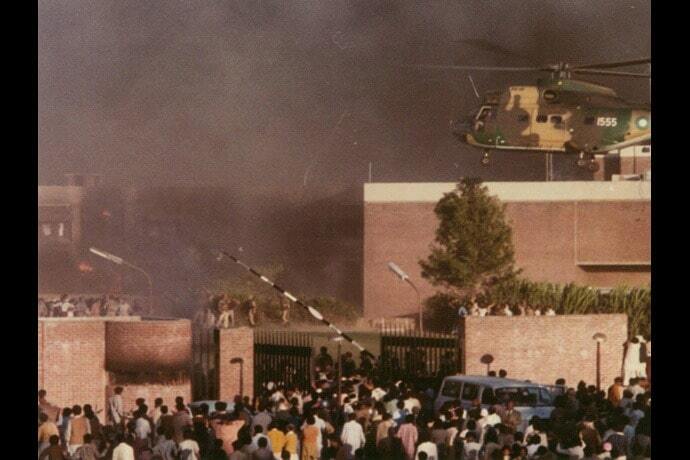 However, about fifteen minutes later, some six busloads of Pakistani students arrived and laid siege to the American embassy compound for several hours, from midday until nightfall. The students were angry because of suspected U.S. involvement in the coup d’état of Zulfikar Ali Bhutto in 1977 and execution in April 1979. The final straw came from false reports, made by Iran’s Supreme Leader, Ayatollah Khomeini, that the United States had launched a terrorist attack on the Grand Mosque, Masjid al-Haram, at Mecca. When the siege finally ended, the American embassy campus was utterly destroyed and six had died, including Marine Security Guard Corporal Steven Crowley, 20, Army Warrant Officer Bryan Ellis, 30, and two Pakistani staff members were killed in the attack, along with two student protesters. The following account comes from a taped report made by Islamabad Cultural Public Affairs Officer (CPAO) James P. Thurber, Jr., on November 23, 1979 — just two days after the attack — and transcribed by his son, Alex Thurber. Thurber was one of the many embassy personnel who sought safety in the embassy communications vault during the siege. This account was originally made for Thurber’s wife and family members. Go here to read another account of the Embassy Islamabad attack. Go here for more about the Iran hostage crisis from one of the hostages. Read other Moments on embassy security. THURBER: It was a lovely day in Islamabad, typical fall weather: crisp, cool, but not cold. 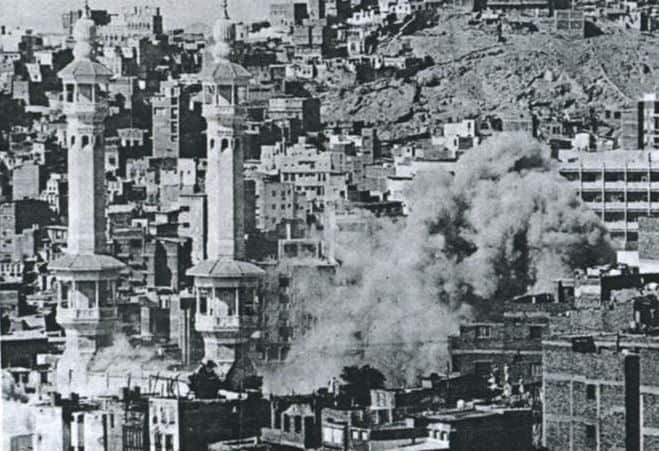 There were problems in the Middle East, in Tehran, and particularly we were having reports that the historic and sacred Muslim shrine in Mecca had been attacked and occupied by some type of rebel group, identity unknown. 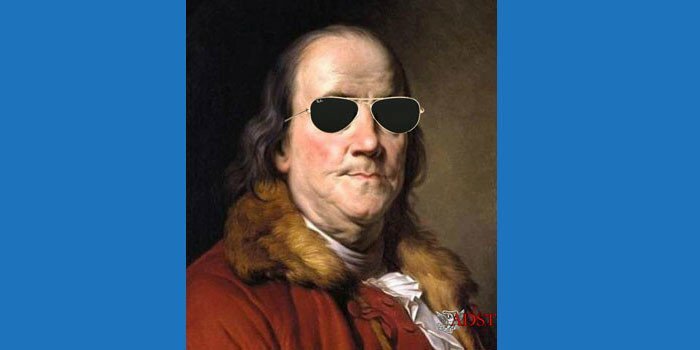 These reports were coming over the radio in the morning, there were vague references to the situation in Tehran….This was the time that the employees in the American Embassy had been taken hostage, and at the time of the incidents in Islamabad, had been captives for two weeks. 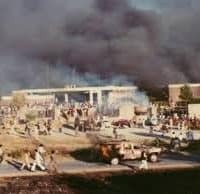 From the best of our information, students at the university and throughout the Rawalpindi/Islamabad area came to the conclusion that the Americans, as a counter to the Tehran situation, had been involved in the takeover of the Shrine in Mecca, which naturally enraged them and sent them looking for a target. About ten past noon, two busloads of students arrived at the front of the Embassy building. Let me just very briefly describe Islamabad. The Embassy occupies a 30-acre compound on the edge of Islamabad. It is a long, low-brick building, two stories high in front, three stories in the back, and in the back of the Embassy, there are two buildings of 30 apartments, a club building, tennis courts, swimming pool and so forth. A beautiful compound, all done in brick with a brick wall around part of it, and a cyclone hedge or cyclone fence around the balance. The two busloads of students drove up in front of the Embassy compound, at which point our security guards locked the front gate, which is a large metal bar gate. The students came to the front gate, banged on it, and demanded entry. 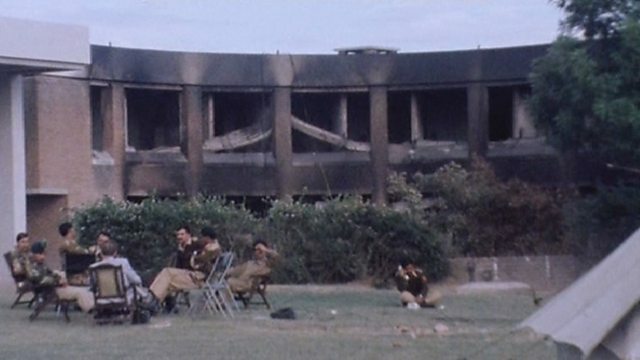 At this point, a small group of police officers who were stationed outside the Embassy as part of their normal duties, drove the students away, forced them back into their buses, and they departed in the direction of Quaid-e-Azam University, which is located several miles behind the Embassy. My office is located at the back side of the Embassy, facing the university and the road that leads past the Russian and Chinese embassies, from the university to the back of the American compound. After about fifteen minutes, I happened to be looking out the window — this is now about 12:45 — and saw the two red buses that we had originally had in front of the Embassy, coming back, followed by four university buses jammed with students, with many of them sitting on the top. I immediately notified the Marines, who sounded a general alert for the entire Embassy. This means all safes are closed, classified material is put away, windows are closed, people get away from the windows, and the Marines go to full battle condition. The buses arrived at the front of the Embassy, and the students poured out — completely overwhelming the very small police guard — taking away their weapons from them, and started at the Embassy. They could not get through the gate. They pushed against one of the sections of the wall, a combination of brick and steel bars, and much to our absolute amazement, the whole unit gave way and collapsed in. At this point, our soldiers — or police, I think they were — had retreated inside the Embassy grounds in front of the building. They first fired tear gas canisters at the oncoming crowd. This didn’t work, and they started firing rounds of 30-mm cartridges over the heads of the oncoming crowd, which of course did not stop them in the slightest. If this all sounds unemotional, I’m dictating this 48 hours after the incident, with one hour’s sleep in the whole interval, and I’m sort of out-emotioned at this point, having helped carry one body down the front of the Embassy, discovered another one 50 percent burned, and helped get both of them into caskets and on their way to the States. One’s emotions just last so long I guess, and then temporarily disappear. It looked to me as if there were hundreds outside. I understand that the final count came closer to ten thousand. It was obvious that they were going to get into the Embassy somehow. We moved everybody upstairs to the top floor of the Embassy. We were at the top of the stairs with about 80 people, half Pakistanis, half Americans, and the Marines — tear gas, the whole works. We had one grillwork between us and the bottom floors, and when the demonstrators finally just literally tore massive steel grilling apart by sheer weight of numbers and ropes and whatever else they managed to get their hands on, they got into the downstairs area. 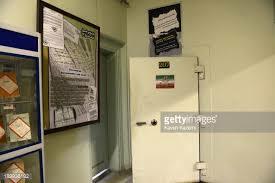 We moved there down the hallway to the so-called vault area, which is where the Embassy has its very secure classified materials, cryptographic information and so forth. Usually, this is completely secret, but since a Time Magazine reporter was in my office at the time all this took place, and joined us in the vault, I am sure you’ve all seen graphic descriptions in Time Magazine of what it looks like and where we were. We moved into the vault, there is a double-door system there. You move through one steel door from the corridor to an ante-room, and then through another steel door into the vault itself, which is a room, which is where we spent the rest of the afternoon. You sort of have to picture this as 80 people in a room that could probably hardly take about ten or fifteen, Marines outside, holding off first a mob and secondly a fire, and a very great lack of communication. Let’s take each one by itself, because it is hard to put all this together. The best we can figure out as to what happened was that then, seeing that they couldn’t get in, the mob at that point set fire to the Embassy, hoping to drive us out by smoke. Many of us who have now seen the Embassy from the outside and talked with enough people, have the feeling that they weren’t trying to drive us out — they were trying to get rid of us. Inside, we were trying to find out what was going on outside. For a few minutes we had communications with Washington, and we were able to send reports to them — we didn’t receive anything back; things were going too fast. Then our main power was cut, and all we had was auxiliary lighting, which of course isn’t enough to run our high-powered transmitter. Following that, we resorted to telephone, which did work for a while, and when that broke down, when they managed to destroy the main telephone system in the basement of the building, we resorted to our walkie-talkies, which several of us had brought into the vault. These worked with a fantastic irregularity. All of a sudden, we could talk with someone out at the International School, which is several miles away, and they could talk with us, and then that would go off, and we wouldn’t be able to reach our Ambassador, who was only a mile away. Things fluctuated back and forth all afternoon. In another corridor off to the other side, they brought down the Marine [Steven Crowley] who had been on the roof of the building and had been hit by gunfire at the beginning of the attack. He was being treated by Fran Fields, our Embassy nurse, who made repeated calls for help from a doctor — none showed up, and we aren’t sure that the calls even got out of the Embassy. 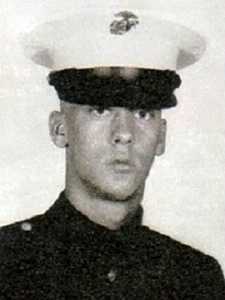 The Marine unfortunately died at 3:35 in the afternoon. He was a young man, one who we all knew and one who was extremely popular. Another American was killed — I’ll try and cover him later, as he was in another part of the compound. Explosions rocked the building. A great deal of noise and confusion on the roof over our heads, banging on the grills, eventually firing with, I guess, again 30-caliber rifles down the grills. Bullets rattling around over our heads — none actually came through, why, I haven’t a clue. As the afternoon progressed, the temperature started to build up. We got smoke in spite of our attempts to cover the doorways and all the cracks around the doors, and then we started to get tear gas as a combination, and it turns out that smoke rises and tear gas drops. So to find yourself in a happy medium between these two, when you are in the vault is pretty difficult. In spite of all this, morale was just miraculous — nobody panicked, nobody yelled, nobody screamed. It was getting hotter and hotter, we were discarding excess clothing, and yet everybody kept their cool. About four o’clock, the first real reaction to the tear gas and smoke set in. We were getting vomiting and a tremendous amount of coughing, but again, no hysterics. And there never were any hysterics during the whole afternoon. Time sort of leaves us at this point. it is hard for us to remember exactly what did happen at the time. As the heat built up around five o’clock, we started to get a little more desperate on the radio. We were getting some communications through, and there was a tremendous amount of confusion as to what was going on outside. We kept being told that the Pakistani military had guaranteed that the roof was cleared and that we should come through a hatchway onto the roof and get out that way. At the same time, our Marines who were located close to that hatchway were telling us, “No, people are banging on the hatch.” And they were banging on the incinerator roof pipe, and there are “unfriendly forces” on the roof, as they put it. In fact, the bullets that came down the pipe were evidence of that. The explosions on the roof and the explosions in the back were further evidence that there were not friendlies up there. Finally, and now I have absolutely lost track of time, I would say this was now 6 o’clock — I could be an hour off — it could be 5 o’clock. At about 6 o’clock, the temperature had built up to a point where it was not only uncomfortable, but the floor was buckling under our feet. The vinyl tile was melting, the rug was burning — we managed to put it out with some cans of beer that we found, we didn’t dare use the CO2 extinguishers, because they absorb oxygen from the air, at least that was our memory, and we didn’t want to do anything more. People were showing effects of oxygen starvation, and the tear gas was still pretty heavy. That stuff doesn’t go away in a hurry. We notified our one contact on the outside that we had to get out and that they should clear the roof no matter what it took. We got no response. In the room, in a little corridor leading off to where the Marines were, is a hatchway up to the roof. It had been banged on all afternoon. Somebody had been trying to get into it, obviously, as we saw it when we went up. It was badly damaged, and there were a lot of attempts to break their way down to where we were and do whatever they had intended to do. We decided to send out two Marines to reconnoiter the situation. The hatch jammed on them. Finally, with a great deal of banging and clacking, we managed to break the hatch open. They went out on to the roof; it was vacant. Nobody was there, and they — we — ordered the immediate evacuation. We sent out first the women, three at a time through a very heavily smoke-filled corridor, up a ladder, straight up about 12 feet, and then onto the roof where the Marines had laid down a security area with protection, and helped everybody out. The evacuation of all 80 people, 3 to 5 people at a time, took about 15 minutes. I was one of the last people out. As I left, vision had disappeared in the vault, you couldn’t see, and I could hardly breathe. I would say, at that point, we had probably another 5 minutes, or you would have had 80 casualties right there in the vault itself. It took me 48 hours after that to clear the smoke from my lungs, and three washings of my hair, and it still smells of smoke and tear gas, but I think that will go away, but just to give you an idea of the density of it. We got up on the roof, and that had to be a scene as close to Hades as you could possibly imagine. Flames were pouring up on all sides of us. Luckily, it was a heavy cement roof with a tar top to it. The tar in many places was melting, but we were protected. We had to go down three levels. we had to move all the way down the length of the Embassy, down three roof levels, to the auditorium roof, which was not burning at that point. And we went down one of them, which was a short one; we could jump down about 4 feet. The next one was a short one. The next one was 12 feet. Some of us jumped at first, and then we helped everybody else down, literally, by just having them drop into our arms; there was no other way. The flames were getting too close for comfort. Then we got over at that point where we were on top of the auditorium, which was not burning, and we were finally able to scare up the fire department, who came and put a ladder up, and we took everybody down by ladder, onto the ground. Once on the ground, we were right there at the front of the Embassy. They brought up trucks, the Pak military were everywhere; there were armed guards and soldiers. It looked to me like they had a system of one-on-one, because there was one soldier who just stood right next to me everywhere I moved. I was on the radio communications, trying to move everyone out of the compound, because there were still large numbers of hostile demonstrators screaming and yelling outside the compound, and it was a little bit nerve-wracking. The military put us in ambulances and moved us out relatively quickly. I would say that I wasn’t on the ground more than 10 or 15 minutes. I again was one of the last ones to leave the compound, of the Americans. We were put on the ambulances and taken about a mile at the most, maybe only half a mile, to the British Embassy, which was completely untouched, and there were no demonstrations there at all. We were taken under the wing of the British for asylum. The scene at the Embassy was unbelievable. From the front of it, the entire Embassy was on fire. There wasn’t a single window that didn’t have flames shooting out of it. When I was on the roof, as I was running along in a crouch position to stay out of the way of bullets, and looking over at the apartments…and the clubhouse, it was just one sheet of flame coming up, including the staff quarters and so forth. 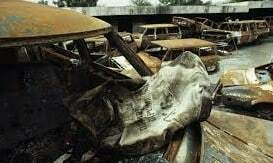 The motor pool with flames pouring out all over the place was really a scene right out of a movie horror story. Okay, we were rescued, and as we left, they started pouring water on the building. Obviously, they ran out of water very quickly. They asked us where’s the water? We pointed to our underground supply, gave them a wrench to open it up, and left. The ambulances took us up to the British Embassy. I should say by way of that, the Marines, who I can’t have enough praise for, wouldn’t leave the building without the body of their comrade, and he was taken along with the rest of us, to the British Embassy. The British had a great risk to themselves, I would say turned out in great number. We were welcomed there. There was beer, and there was hot soup, anything we wanted. The Ambassador, our Ambassador was there. He, by the way, along with the DCM [Deputy Chief of Mission], were home for lunch, luckily, when this thing hit, and once they knew we were going to get out, they had gone over to the British Embassy to greet us. We went upstairs, and the British Ambassador couldn’t have been nicer. He took all of the senior officers into his office. We patched in a phone line to Washington and started in on our reports at that point, all of us taking turns. The Pakistan military came in around 3:00 am and said that the streets were clear and we could go home. Somebody delivered me to the house. I got in, and the phone started ringing; the international press was on it. I lay down somewhere around 6 o’clock. The phone started ringing again around 7. That was that for the night. Nervous energy and adrenaline are marvelous; they keep one going. Our problem on Thursday was to get the people ready to get them out of the country. The Secretary of State had said that all people will leave who aren’t essential, and we were making plans to do that. So — my memory, again is very foggy on Thursday. I know I spent most of the time in contacting members of the ICA staff, and members of the school. I had two responsibilities: one were all the teachers and school staff; the other was my own staff. I was telling people who was going to go where, arguing, debating, setting up lists, deciding who could stay, who had to stay, how would we use the people who did stay, and so forth. Anyway, this was just an all-day affair. It was just one phone call after another, standing around vacant offices in the AID [U.S. Agency for International Development] building, using vacant telephones, and so forth. About 8 o’clock, Fran Fields, who had been home off and on during the day, called and invited me to Thanksgiving dinner. She had invited us earlier, and to tell you the honest truth, I had forgotten all about it. I left the AID building; I went out to Fran’s house. It was a very strange Thanksgiving. Lovely food, I think. I hate to tell Fran, if she’s listening to this, I really didn’t taste a thing. Most of the emotions were sadness; it was a sadness of departure. Thanksgiving, I guess that we were all alive. And this was particularly true when there was a prayer said before, somebody started a prayer, they choked up, and I think there was a good three or four minutes when not a word was said. Finally, one of the kids who was there, said, “time to eat,” and he broke the emotion or tension, thank God….After that, it was back to the Embassy to complete the plans for evacuation. 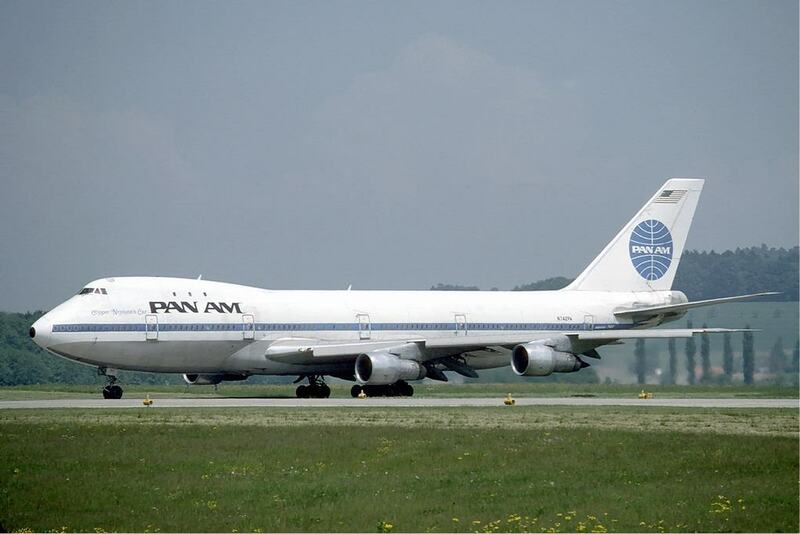 We were getting reports from Pan American, they had dumped all their passengers on Pan Am Flight 1, around the world in Delhi, and heaven help us from the wrath of those passengers, and they were ready to bring their plane into Islamabad. This required clearances and all that sort of stuff, and everybody getting together. The Army was there. We made plans for the motor pool or caravan to the airport. We had to get a hold of everybody, assemble them into 17 different locations in Islamabad. Our house was one of those locations, and we had 20 people here, staying the night, in various states of disarray, on beds, sofas, floor, and so forth. We worked this out with Pakistan military, and they gave us one bus and one truck for each house. So at 3 o’clock, we departed from the AID building, where all these buses and trucks were parked. Each one of the wardens or individuals was responsible for a safe haven house with a truck and a bus and a couple of soldiers. We went to our house here, as an example of all the others, got everybody up: children, pets, the whole works, with our guard, two guards we had in our group, soldiers standing guard outside our house, plus the reinforced security guards, which are still around the house today. We loaded up the truck with all the baggage and those animals that people took out with them, put the people in the bus, and then went back and assembled at the British Embassy. It actually worked out that we had 10 busloads of people, and 10 truckloads of luggage, this was 310 people for the flight, and God knows how many pounds of baggage. Time again eludes me, I think somewhere around 5, because we wanted to move everybody out under the cover of darkness, the convoy moved off from the British Embassy. We went around the corner, where, to the greatest concern of many people on board, we stopped in front of the American Embassy to form the convoy…. We then moved out. I guess we left around 6 am, 5:30, 6 — somewhere around in there, to the airport. We got to the airport in convoy fashion, around 6:30, and the airport was under the most heavy security guard I have ever seen. There were soldiers in full battle dress everywhere. And standing on the ramp, outside the VIP lounge, was the most beautiful sight we had ever seen, a Pan American 747 being refueled, or fixed for flight. I’m not sure if they fueled here or not. Everybody went into the VIP lounge. My job continued with the press. The world press had started to arrive at that point, in fact they were there in numbers. We did not want them in the VIP lounge, for obvious reasons, and Pak security would not let them on the airport runway or on the observation platform to film. So I had the fun job of keeping them happy out in the parking lot, and explaining why they couldn’t come in. This kept me busy, and I think we gave them enough to at least cool them for a while. Somewhere around 7:30, they started loading the plane, after the baggage was on board. And if I remember correctly, around 8:30, with a lot of very sad and unhappy males and a couple of secretaries standing outside the lounge, 63 of us who were left, the plane departed for Karachi. We went back to the AID building, again all of us very groggy but loaded down with things to do to start the wheels moving to try and pick up the pieces and see where we go from here. We had a press conference with the Ambassador, which was fairly general. I had I don’t know how many interviews on camera, off camera, on the telephone, London, Bonn, Tokyo. It was like a miniature United Nations trying to tell what had happened to the press and media of all types. I am right now, this Friday afternoon at 3 o’clock, I scheduled a press conference at the Embassy itself. All the press, television and so forth, gathered there, and I escorted them around the buildings through the compound, not in any buildings, both for security and safety purposes, throughout the entire place. It was my first view of much of it, and it is a sight I will never forget. I hope you have seen it on television, and I hope we get some films of it. Supposedly fireproof buildings — it’s hard to describe it — absolutely burned out from top to bottom. As I look through the windows this afternoon, into our offices and other offices, you could just see safes melted — steel, solid steel melted. There wasn’t a window or a window frame left in the main chancery. Destruction was absolutely complete — things hauled out into the courtyard and torn apart. We moved from there to the motor pool, and back into the covered parking areas, there wasn’t a car that you could even identify. Everything was burned out. Things had just been pulled out, smashed, destroyed and fired. A great discussion was underway as to how the fire got to the intensity that it did. A great deal of paint was thrown around, and it is very possible that they used paint as Molotov cocktails, I’m not sure. We went down into the residential area. There wasn’t a single apartment out of 30 in the residential area that hadn’t been absolutely, completely burned out. I went into the health unit. There wasn’t a thing left in the health unit. It was unbelievable, even the examining table, which is steel, was melted into a hunk, or a pile of molten lead, or metal, or whatever it was made of. The swimming pool: full of junk. They must have taken every flower pot in the area and thrown it in. And fires everywhere. They even managed to light a fire under the referee’s chairs at the tennis court, but for those who love tennis, for some reason, they didn’t know how to destroy a clay court. And we are going to be back there in a week or two, because all we got to do is clean up a little paint and get rid of some charred chairs and so forth, and we’re back in business, if we can find some nets; they were destroyed. The club burned out; nothing left of the club. The servants’ quarters in back absolutely burned out — nothing left, completely destroyed. If we had known what was going on outside, the extent of the fire, that everything around us was burning, I don’t think we would have made it. It was probably just lucky that our communications were so lousy, that we did survive. Survive by just faith that we were going to get out. But if you could have seen, and could see now the sight I saw this afternoon, those bricks absolutely blackened, fires still smoldering from the cars, smoke still rising from the Embassy, a sight that is just unbelievable, that so much damage should have been caused. We tried to get an estimate on the number of people involved. The papers, people who were there, report 10,000 to 20,000. I think probably that’s too high, probably far too high. I don’t think they could get that many people together in Islamabad. But it was very high. A tragic event: Chief Warrant Officer Ellis, I think those who served here will know him, somehow was caught in his apartment. I don’t know whether he saw the people coming and ran in to it, ran into the back. We found his body this afternoon, burned beyond recognition in the bedroom area of his apartment. He was the only casualty that we found in the apartments. Two other bodies were found in the basement of the building, two local employees, both of whom we all know. They apparently didn’t want to jump out of the window, and tried to go back into the corridor during the burning of the Embassy, and were overcome by smoke and then died from that or the heat. And there were at least two demonstrators who were killed in the process. So with the Marine and the Chief Warrant Officer and the two demonstrators and our two local, you have six deaths out of this absolutely useless display of I don’t know what — emotion over something which meant nothing, and nobody, when it was all over, knew what they had been demonstrating about. So here we are in Islamabad; I’m not quite sure what to say. Security seems good now; the town is an army camp. We’ve all taken the license plates off our cars, what we have left of our cars. I lost my Holden, my lovely Holden was at the Embassy and is burned to a crisp. Though we still have our Datsun, which I am now driving with Canadian license plates. Our friends at the Canadian Embassy loaned me a set. For safety’s sake, I’ll keep them on for a while. But it looks like the lid is on. The army’s got control, and they’re not going to let it happen again. We’ve taken what security we can, and I feel fairly confident that it won’t happen again. I guess my only feeling now is I’ve got to get some sleep. It’s been a long two days, and, as I say, I want to put this down on tape; I haven’t the energy to type it out. So I’ll send the tape to the States. Pass it around to anybody who wants to hear it, and they’ll know what happened here in Islamabad. What we went through was probably minor compared to what is going on in Tehran with the hostages there, and I guess the only things that really shake us are the reports that we’ve now heard from the students and the other demonstrators, that their goal was to kill us, and to prove a point. They are now somewhat shamefaced, somewhat bashful about it, glad, I guess, that they didn’t create 80 corpses, and glad that we did get out and they proved a point, and certainly anybody who drives past the American Embassy today in Islamabad has seen the destruction that a mob can cause upon an installation, one that was here for peaceful and humanitarian purposes, and for the conduct of governmental business and which, unfortunately, was in the wrong place at the wrong time. I like Islamabad, I like Pakistanis, and I want to stay here, only if my family comes back, but I think we have a place here, and I think the Pakistanis like us. As I say, I want to stay. I’m going to do the best I can to make our government let us stay here to recreate the atmosphere that we used to have here, because I think it’s the right way to go, and I think we should be here working with the Pakistanis for the betterment of both our countries, and for the relationship between our two countries.